I regard Horrible Bosses very highly and consider it one of my favorite black comedies. It was packed with wit, bite and managed to get me on board with the desire of a group a relatable guys to off their bosses. Thanks to some horrible bosses in some board room somewhere, we have a sequel that just may have ruined the original for me. I may never be able to look at it the same way. 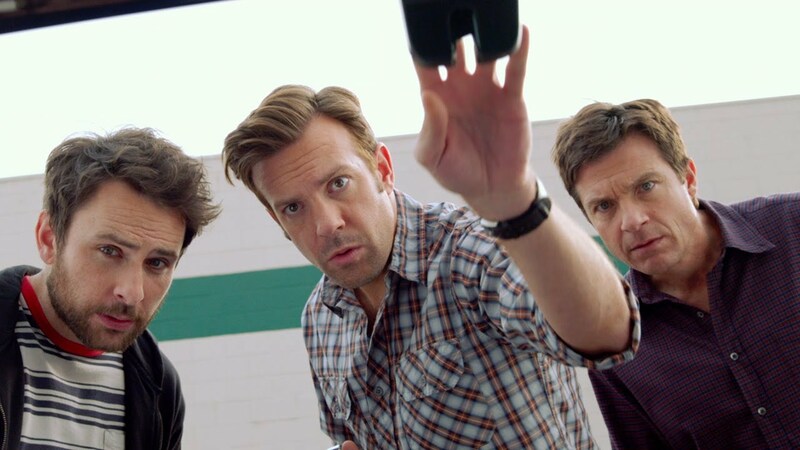 Horrible Bosses 2 transitions from a dark comedy into more of a comedy thriller here but it relies on mostly bland and pointless characters, infantile jokes and vulgar soaked dialogue turned up to 11 from Sean Anders and John Morris. It did not work well for me at all. Jamie Foxx, Jennifer Aniston and Kevin Spacy return to collect a paycheck and Christoph Waltz shows up – also for the check. The only new comer who looks interested in the film is Chris Pine who looks enthused by this comedy and perhaps earns his pay. At the center of everything are of course Nick (Jason Bateman), Kurt (Jason Sudeikis), and Dale (Charlie Day). They have started their own business (Nick & Kurt & Dale) and are set to appear on a TV morning show to showcase and gain financing for their invention, the Shower Buddy. The TV appearance does not go as planned as the film sets its tone with its first batch of crass offensive jokes which garnered lots of laughs from my screening and indeed myself but laughs do not make a good comedy much like scares do not make a good horror. They eventually turn to investors Rex Hanson played by Chris Pine and his father Bert (Christoph Waltz) who initially agree to finance the initial production of Shower Buddies but later on screw over our entrepreneurial trio in a harsh introduction to the cut throat world of the American business terrain. Nick, Kurt and Dale’s response to this is to kidnap Bert’s son Rex and hold him for ransom money they hope to use to save their business. The plan becomes easier (or harder) when they realize Rex is also interested, or even more interested than the 3 asinine characters, in getting the ransom. I’m guessing the 3 are meant to be the Horrible Bosses of this particular film providing it isn’t referring to the studio executives who gave this film the green light. The problem is who are they bosses to and does the audience really deem them as horrible and detestable as their borderline psychopath bosses in its predecessor? We genuinely disliked the trio of bosses in the first film making it easier to buy into the characters and the script. We also got the view point of the underlings and root for them when they opt for killing each other’s bosses but who are their underlings here? If I was a subordinate I’m pretty sure I would love them if they kidnaped some capitalist to save my livelihood. I read there were rumors this film would find Bateman, Sudeikis, and Day in the boss roles with three new guys looking to kill them. I would have loved that twist on their characters. I also wish I had a less corrupt government and world peace but hey, what can you do? That has the makings of a more ambitious script but we are stuck with the underused Waltz and amped up versions of Anniston, Spacey and Foxx’s characters from the first film to go with the loutish slapstick from the central trio. There were some kids in my screening room and nothing in this film was okay for them – horrible parents. I guess it’s a bit unfair to not credit to Bateman, Sudeikis, and Day who bring some chemistry variance to the comic energy but it’s all channeled into this sub-par script. Every single member of the cast deserved more than this script offered. It never helps when a film makes you long for its superior predecessor and I guess it also never helps when a film decides to just not be not good. Length, dullness and unnecessary vulgarities (I cannot emphasize this enough) combine to make this film one of the more disappointing films of this year especially when held up to its brilliant predecessor.